Audiences are familiar with the enchanted underwater world of Ariel, King Triton, Sebastian, and Flounder. But life in the deep sea kingdom of Atlantica wasn’t always concerts and melodies. It’s all explained in The Little Mermaid: Ariel’s Beginning. It’s the story of a younger Ariel in a time when music was banned from the kingdom. 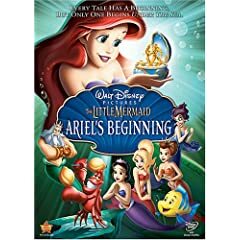 Reprising their roles as Ariel and Sebastian, vocal talents Jodi Benson and Samuel E. Wright create a new spellbinding chapter in this Disney princess’ saga. With new fishy friends and foes, and bubbling up with new beats, this prequel splashes onto DVD August 26th! us your favorite celebrity dad, real or fictional, and why. Use the comment form below to let us know your vote. We’ll draw three winners from the best responses on August 16 who will get a free DVD of The Little Mermaid.